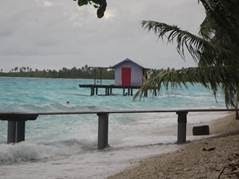 For a couple of days, the weather in Apataki was beautiful; the sun shining brightly in the blue sky and the waves of the lagoon lapping gently on the coral beach. Then, the wind shifted to the north again and arrived with a vengeance. The lagoon water churned up, the wind chop grew, the waves produced foam while crashing on shore and it was blowing a steady 30+ knots, with squalls bringing 40-50 knots! 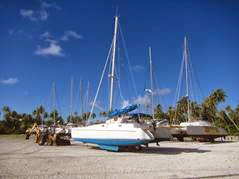 The big sailboats on the moorings pitched wildly. 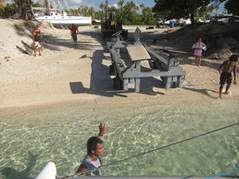 Luckily, Mark and I were safely on the blocks and stands by then, “barely” noticing the mayhem inside the atoll. 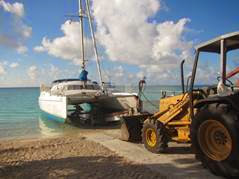 The boat didn’t move at all; we were safely “anchored” on terra firma. It was actually fun to see our wind meter climb higher and higher to wind speeds it had never registered before. Two days prior, we were promised a morning haulout. 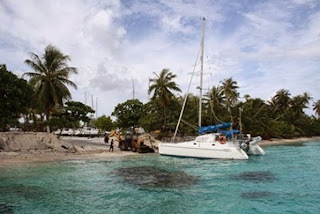 By the time their machine was fixed and the boat ramp was cleared of all the coral rubble, which washes up constantly, and taking the long lunch break into account, the day had mostly passed. Initially, we were very relaxed about it, but when 2pm arrived, all the waiting around did get us a bit antsy to get going. 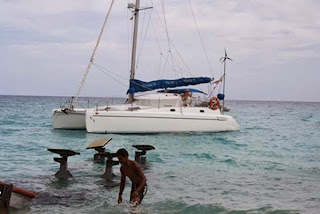 Around 4pm, we were instructed to approach the carenage (boat yard), following a path in between coral heads, and once we were close enough to shore (too close for comfort in any other situation), lines held Irie in place, about 5 feet from the beach. The whole lifting us out of the water was a sight to behold, involving a few people, a tractor, and a trailer with soft pads supporting our bridge deck. Alfred worked the controls, son Tony was in the water inspecting and instructing, Alfred’s wife Pauline gave mental support and stood by in case of emergency or language barriers and Nini took care of all the other odds and ends. Alfred’s dad Assam was present as well. Not a bad thought, if it weren’t for a few minor inconveniences: the trees totally blocked our wind generator, so while the heavy weather brought all the electricity needed just in wind alone, we received none; being faced southeast, the breeze rarely entered the boat, so it was hot inside at all times; and just imagine what falls out of trees when it is windy... I’ll just say that we couldn’t collect any of the rain because of natural debris landing and staying on our roof, that our ant population multiplied and thrived on the dead bugs falling out of the sky and that our gecko population tripled as well. And, that mosquitoes LOVE shady areas, so they kept us company from dawn till dusk, cheerfully ignoring the mosquito spray we applied and the coils we lighted. 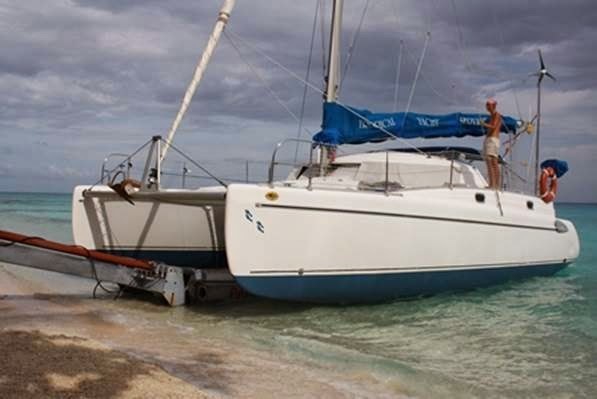 All that being sad, our stay in Apataki Carenage was one of best haulout experiences we have had in seven years of sailing. And believe me, we have hauled out plenty of times, probably beating the record in the cruising community with an average of 1-2 shore visits a year! Do the math… The climate outside was just about perfect; none of that super-hot and sticky summer weather of the Caribbean. 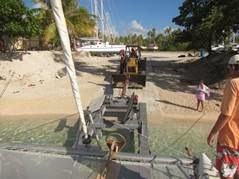 Of course it is beneficial to have a catamaran and work intermittently on the shady sides. 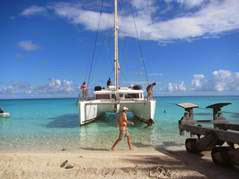 The Lau family is very friendly, helpful, accommodating and professional. 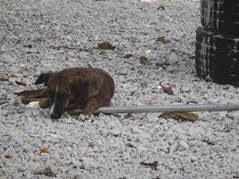 They have their act together, especially considering this place in the Tuamotus is fairly remote. The usual facilities of a boatyard are absent: the toilet barely works, there is no shower, there is no running water (so no pressurized hoses), every boat receives a big barrel of well water to use for cleaning and rinsing (it gets filled regularly), there are no trash containers (your garbage gets picked up by Nini once in a while) and there is no electricity. You can rent a generator or use your own. 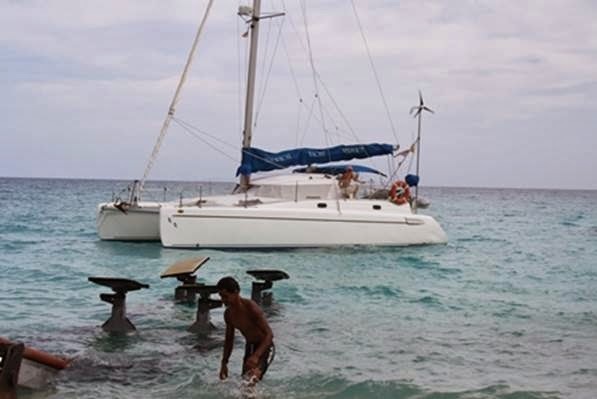 Apataki Carenage is truly a do-it-yourself, bring-it-yourself boatyard. Come prepared! 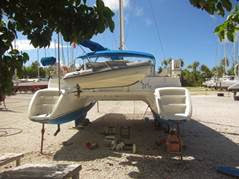 Tony can be hired to do boat work, you are allowed to borrow some tools and they have selected marine items for sale, but it is best to ask ahead of time about particularities and order your bottom paint. They are very responsive by email, but speak limited English. Being able to communicate in French is advised and very helpful. 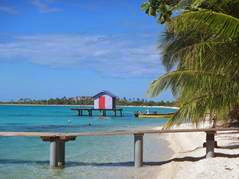 The location is unique, with the clear water of the lagoon a few feet away and the palm trees offering sweet coconut water. Fresh eggs can be bought from grandma and the family offers taxi service to the village. 16 tons is the maximum boat weight they allow and 2 meters the maximum draft, but they are very accommodating if there are special needs. All you need to do is ask. 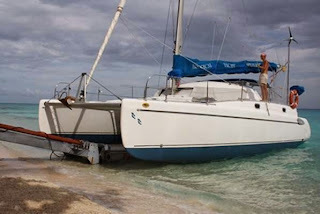 Rinsing the boat with cups of water – very inconvenient and time-consuming! Irie is cleaned, scraped, sanded, washed, painted and waxed. She is stain- and scum-free and “as good as new”. 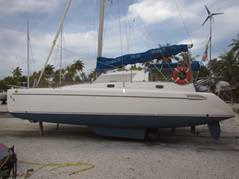 The sail drives underwent the same procedure with different paint and had their seals and thru hulls replaced, and the rudders received new bushings. 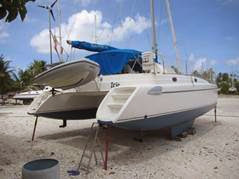 We were lucky to have another cruiser fix a rip in our jib (which, unfortunately needs replacing) and even managed to bake bread (there is no food on this island) and do laundry. And right now, we are back in the water, relieved about our successful haulout and our shorter project list, and … we are ready to see and enjoy some of these Tuamotus, also called “the dangerous archipelago”! 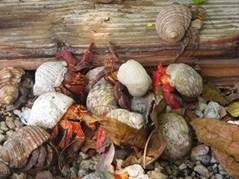 Hermit crabs abound – we have never seen or avoided stepping on so many of them (especially at night)! Rudders back in place. Now we are ready to splash (launch)!